Don't be snooty about using frozen spinach – it's an incredibly useful shortcut in situations where you want your spinach to be well cooked and squeezed dry. Mascarpone cheese is another crafty shortcut, getting you out of making a proper bechamel sauce. With salty pockets of pancetta, this dish produces a really warming supper. If you want a meat-free version, leave out the pancetta and replace with Gorgonzola. Boil a large saucepan of salted water over a really high heat with the lid on. Preheat the grill to high. Pour the olive oil and put the pancetta into a frying pan and fry over a high heat for 3 minutes until brown and crisp. Pop the gnocchi into the boiling water and wait until they are bobbing on the surface, which should take 2–3 minutes, then drain and transfer to a baking dish. 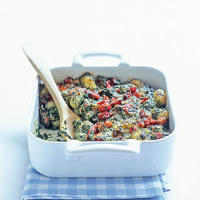 Add the spinach and tomatoes to the pancetta and stir-fry for 1–2 minutes to get rid of any excess water, then add the Mascarpone and heat for a minute until melted. Season with black pepper and a little nutmeg – it won't need any salt because the pancetta will provide that – and stir in half the Parmesan. Pour the spinach sauce over the gnocchi and scatter over the grated Parmesan. Place under the grill for 3–5 minutes until the cheese on top is really golden and the sauce underneath is bubbling up around the edges. Scoop out a healthy portion onto each plate and, if you want something fresh to go with it, serve with a simple green salad.